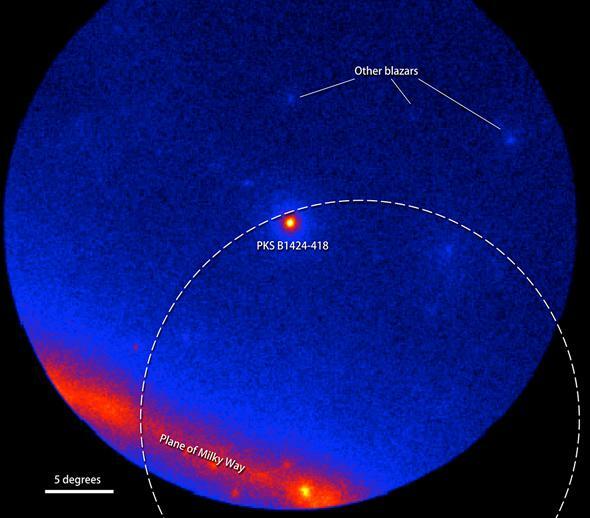 Ultra high-energy neutrino may have come from a supermassive black hole across the universe. Did a Super-Mega-Ultra Neutrino Come From a Black Hole Gobbling Down Matter 10 Billion Light-Years Away? Artist’s drawing of a black hole blasting out an intense beam of radiation and matter. Something like this may have been the source of a phenomenally high-energy subatomic particle detected in 2012. Astronomers may have solved a mystery that started a few years ago. Or 9.5 billion years ago, depending on how you look at it. Even better? This mystery involves, in no particular order: neutrinos, Antarctica, faster than light travel, bizarre radiation, the Fermi observatory, gamma rays, and a supermassive black hole with its barrel aimed right at us. That’s like astronomical mystery bingo right there. OK, here’s how this played out. In 2012, astronomers detected an extremely high-energy neutrino slamming into the ground. Neutrinos are a weird kind of subatomic particle, created by things like nuclear fusion in the Sun’s core, fission in nuclear reactors on Earth, stars exploding out in the Universe, and even when matter falls into a black hole. Neutrinos are very standoffish and don’t react to matter; they can easily pass through the entire Earth like it was completely transparent. Which to them it really is. When they do this, they create a flash of energy that’s the equivalent of a sonic boom, but with light. I sometimes call this a photonic boom, but the technical term is Cherenkov radiation. That flash of blue light can be detected if the ice is clear enough. There are parts of Antarctica where that’s the case, and so scientists built IceCube, a series of detectors buried deep in the south polar ice. In 2012 it detected a whopper of a neutrino (nicknamed Big Bird; all these events are named after Sesame Street characters to make it easier to keep track of them). The energy in that single neutrino was staggering beyond staggering: It contained 1,000 trillion times as much energy as a photon of visible light. If that neutrino had hit someone they would have felt it. A blow from a single subatomic particle. Egads. The mystery is a bit obvious: What the heck can create a neutrino with that kind of soul-crushing energy? One suspect is a supermassive black hole, the kind located in the centers of galaxies. Matter falling into them forms a swirling disk, and can also focus twin beams of matter and energy that scream out of the poles of the disk at very high speeds. Many such active galaxies are known, and most emit energy across the electromagnetic spectrum at one level or another. But if the beams are aimed right at us, we see a lot of very high energy light from them, including gamma rays. We call these objects blazars. We see blazars all over the sky, though. Is there any way to narrow down the suspect list? 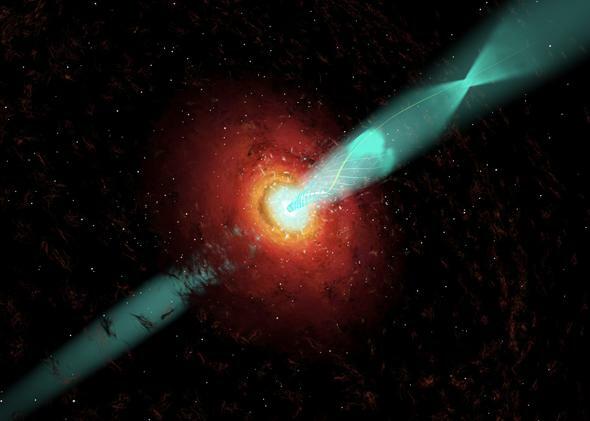 The suspect blazar blasts out gamma rays, as seen by Fermi. Yes! IceCube was able to track the subatomic shrapnel shower backward, upward, and give a very rough area in the sky from which it must have come. Astronomers then used Fermi, an orbiting gamma-ray observatory, to see if any blazars happened to be particularly active at that time. And they did. Confirming this with TANAMI, an array of radio telescopes, they found that the blazar PKS B1424-418 had a monstrous flare-up during this time. During the yearlong blast, it blazed with gamma rays 15–30 times brighter than usual. That’s just such an event that could create the ultra-high energy of Big Bird. So, case closed? Well, maybe. Blazars don’t flare like that often, and the fact that it happened at the right place at the right time is pretty compelling. There’s always room for doubt, but this seems like the astronomers have made a pretty good case. They found the motive, means, and opportunity. Now I know at this point your head may be swimming with all these terms and technology, but I still have one more thing I want to plant into your brain. Think on this for a moment: PKS B1424-418 is one of the brightest gamma ray sources in the sky … even though it’s located 9.5 billion light-years from Earth. That’s two-thirds of the way to the edge of the observable Universe! That’s a long, long way. And yet it produces enough energy to shine brightly in our skies, if you have gamma ray eyes. Which, I’ll note, astronomers do. And that mind-stompingly distant galaxy produced a hail of subatomic particles that shot across the cosmos at just a hair under the speed of light, passing galaxies and clouds of dust and gas and heaven knows what else, only to be stopped by a single molecule of frozen water on a tiny blue-green planet, creating a flash of light so faint it took sophisticated technology and advanced science to see it at all. And astronomers traced that flash of light led backwards to one of the most energetic and violent objects in the Universe. Look. I love science fiction, and superhero movies, and all that. But no matter how bizarre a story fiction tells, they can’t hold a candle to the real thing. The Universe has way better stories than we do. And we read them through science.